Several discussions ago on The Feminine Differential I brought up accessories. I am not talking about white-wall-tires (remember those), heater, and hub caps. I am taking about taking any outfit, however boring, and giving it pizzas. Accessorizing is a creative process that will help you look put together. Lets face it, the outfit above can be guy or girl. 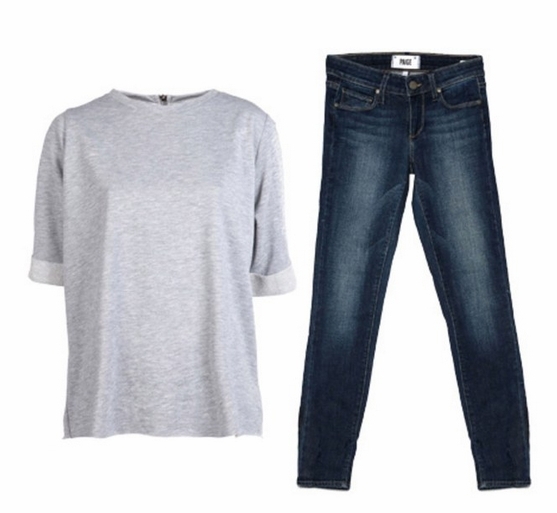 Basic t-shirt or sweat shirt, and jeans. This is my every day comfort look for going to Home Depot or mission shopping at the mall. But take a look how just a few accessories can change the outfit and look. 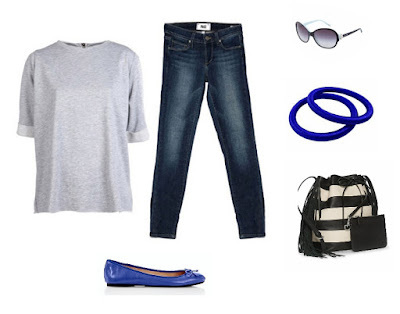 The Accessories That Will Update a Gray T-Shirt and Jeans for a Lunch with Friends. The Accessories That Will Update a Gray T-shirt and Jeans for Casual Meeting. So here is what accessorizing can do. Bring attention to your best points and minimize your worst. Bring an older outfit up-to-date and make it last another season with this season's accessories. Look and feel younger -- regularly updating your accessories is a great way to stay contemporary without having to spend a fortune. Get the "look" you want -- such as chic, elegant, sophisticated, wealthy, business, casual, fun, artistic and so on. 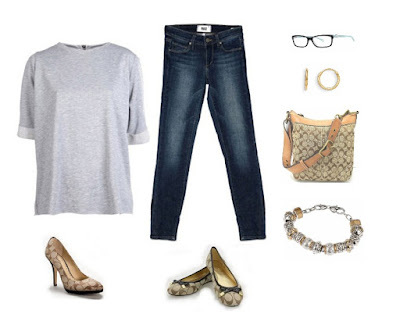 Change the look of an outfit -- from casual to formal and vice versa, by changing the accessories you wear. For example, change your shoes, handbag and jewellery (and maybe your top too) to go from work to an evening event. So give it a try - Add one accessory to you look, get comfortable with that add another. Find what works for you. People don't care. Harper's Bazaar: Stuck in a jeans and t-shirt rut? Get inspired by our gallery of the best denim looks worn by the most stylish stars and models.